I will be making ornaments for the next few week in time for Christmas, below are some pictures of ones I had for last weekends Sale and they were a hit ! Especially the cardinals and I have to make 18 just to fill orders I got on FB ! I’ll make more ⛄️ snowmen too as I’ve only got 2 left and I think they are plain ones ( no color on body except the buttons) bird houses were popular too with cardinals and blue bird of happiness at the door hole . The carrots were also popular lol ! I’ll make more !!! Started late last eve by rolling out slabs and cutting some of the needed shapes . Gottem packed in plastic for the magic that will happen! I use a high temperature grogless white Stoneware claybody made with locally mined ingredients from Loafers Glory, NC. It’s close to a porcelain type claybody but strong like stoneware. It is perfect for all your baking and serving needs as it is the strongest clay available. Some knobs/feet and handles are made with the whitest porcelain available anywhere and are left unglazed for the beauty, they clean up easy with either Comet or Dawn dish soap though dishwasher cleans it up nicely. Bottom of the dishwasher and oven safe. Start with a cold oven and room temperature pot. 325* F recommended. Before adding hot liquids/food to a room temp pot such as tureen/platter or teapot run under hot water to preheat. When removing hot pot from oven place on a dish towel or wood trivet/cutting board and not directly onto a cold marble or other surface that is cold. Fired to 2400* F this clay can take the heat but no quick and extreme temperature changes. It takes 18 hours to fire and 3 days to cool down the kiln its fired in. 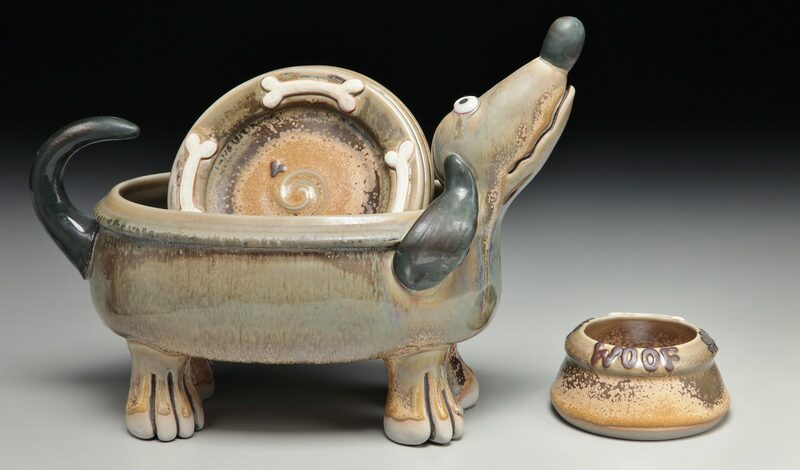 Glazes are all safe and loved to be rubbed to a high shine with paper towel or terry cloth. I sometimes use cane handles on my pots such as baskets and teapots and they need to be spritzed with water on occassion to keep from drying out too much. If you live in a high humidity area adding a bit of bleach to the water keeps any mold from forming and will get rid of any if it has formed. Thank you for choosing my Pottery for your Home and Life. It’s the best of the best and every step is made by me alone with no mass production methods, it’s the real deal. Everything UNIQUE and ONE OF A KIND. All pots are retail price . 7% NC sales tax will be added to all sales. Packing/shipping and insurance are separate charge and will be figured in when I get to USP.O. I RECYCLE what I can and ship the most cost effective way possible or you can choose a packing/shipping service in my area .